The Second Edition of this text continues to build on the three aspects of the language discussed in the previous edition--vocabulary, grammar and idioms. 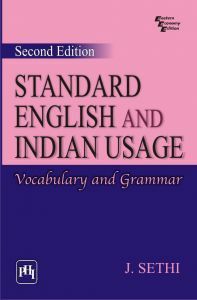 Divided into two parts--Part One: Vocabulary and Part Two: Grammar --the book in Part One deals with 'Words Often Confused', 'Indianisms', 'Indian Coinages', 'Idioms', and 'Archaisms'. Part Two takes up those areas of grammar in which divergences from Standard English are very common--articles, prepositions, tenses, verb patterns, and so on. The emphasis in the Grammar section is not so much on form as on usage. The comments on each divergent item include its Standard English equivalent (and sometimes its origin as well), together with the author's opinion on whether the item should be retained at least within the country. With such contents and features, the book should prove very valuable to a large cross-section of the educated population--students, English teachers, professionals and businessmen. In Chapter 3, new items on 'balance'/'change' and 'marketing'/'shopping' are added. Additional examples have been provided for dependent questions in Chapter 11. Explanations and comments have been made clear at many places and a few items transferred to places where they seemed to fit in better. J. SETHI (MA--Linguistics and English Language Teaching, Leeds University; PhD, English Phonetics) has been Professor of English at Central Institute of English and Foreign Languages (CIEFL)--Deemed University--Hyderabad. He also served as coordinator of the UGC Curriculum Development Centre for English (1986-1991) and Director, Regional Institute of English, Chandigarh. Professor Sethi has rich experience in training teachers and students in Phonetics and Spoken English. He has also published six other books and a number of articles.